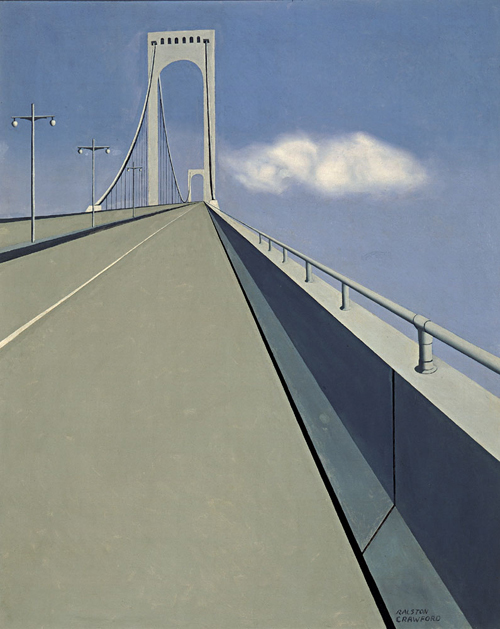 Ralston Crawford's strong linear style and simplified form and palette in Whitestone Bridge are representative of the modern Precisionist style. Precisionist artists celebrated industrialization and technology with a visual language that evoked the purity and perfection of the machine. The Whitestone Bridge, linking The Bronx and Queens, was opened in 1939 just in time for the New York World's Fair. The suspension bridge routed travelers coming to the Fair from Upstate and New England away from the congestion of New York City. At the same time, Crawford was moving away from painting traditional landscapes and searching for a vocabulary that was closer in spirit to the streamlined, industrial aesthetic that he was observing in the world around him. The Whitestone Bridge was an excellent match for his artistic aspirations. The sleek and futuristic lines of the Whitestone Bridge matched the Trylon and Perisphere logo of the World's Fair, which was intended to signify progress and the World of Tomorrow. By 1944, when this painting was acquired by the Encyclopedia Britannica Collection, the sleek and elegant Whitestone Bridge had become an icon of contemporary design. The curator traveled to New York City to determine whether the bridge really looks as though it extends back into space with no land visible on the other side. And, in fact, Crawford's thrilling vantage point can be experienced by taking the bus across the bridge - for a brief instant, the first-time crosser experiences the view that Crawford recorded: a slim line of road, held up by wires, sailing across the water with no end in sight.